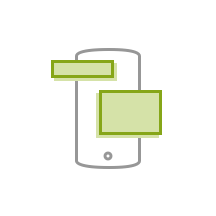 Build mobile apps quickly and without writing a single line of code using our intuitive app maker. 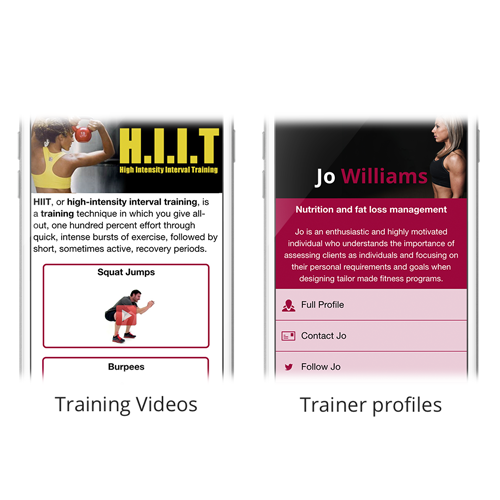 Select a business template to start with an app pre-loaded with all the features and tabs you’ll need. 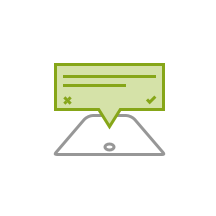 Add, customise, and tweak features and information — all without writing a single line of code. 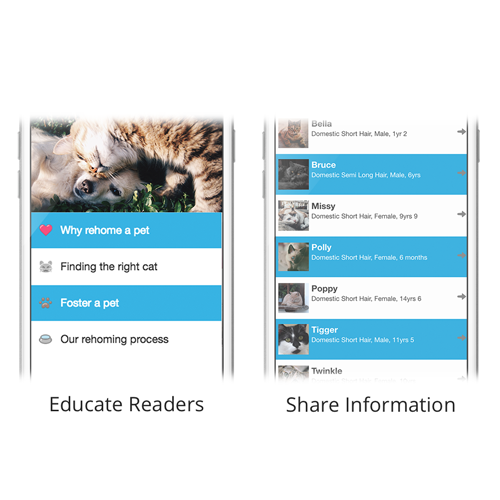 Our app maker wizard makes it super simple to make your brand new app live, in just a few clicks. Make an app for your business in minutes. 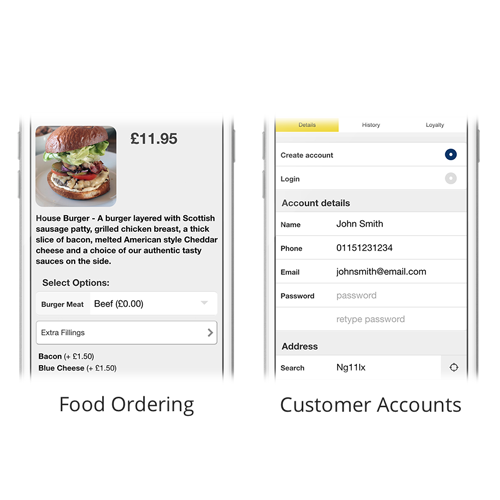 Select your business type and your app comes pre-loaded with the features you’ll need. 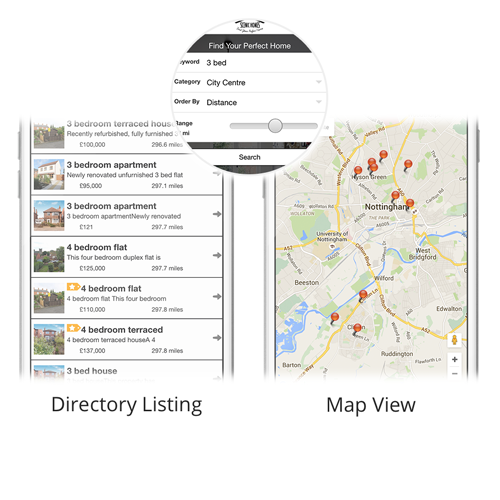 You can automatically make location-based property suggestions to anyone using your app. They can view property images and video, book a viewing, RSVP for an upcoming open house, and get GPS directions -- all without speaking to you. 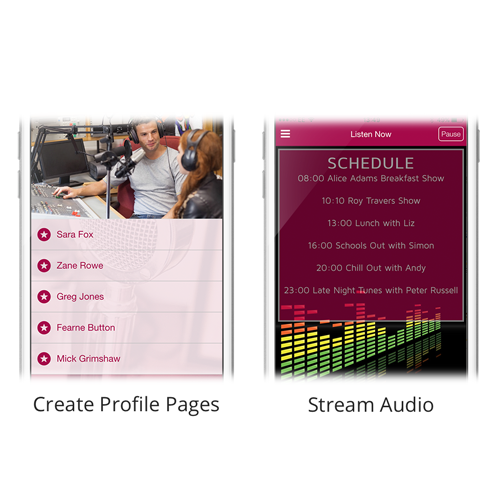 ✓ Make it easy for your listeners to engage with your radio station wherever they are. Easily stream your playlist via Apple and Android Streaming by entering your URLs. Improve your song list by taking requests via a mobile friendly online form. ✓ Share information about health issues. 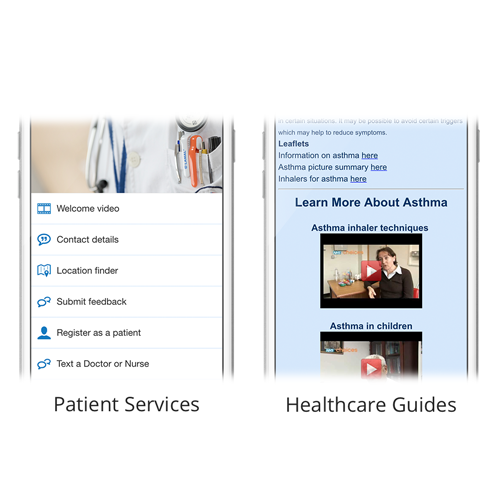 Improve the care of your patients by helping them show up for their appointments and important events on time, and by sharing relevant health information in between visits. Touch the hearts of donors and advocates with an About Us tab that makes it easy to pull in videos from YouTube, audio from your website, and images from your computer and online. Add as many categories to your directory as you need. 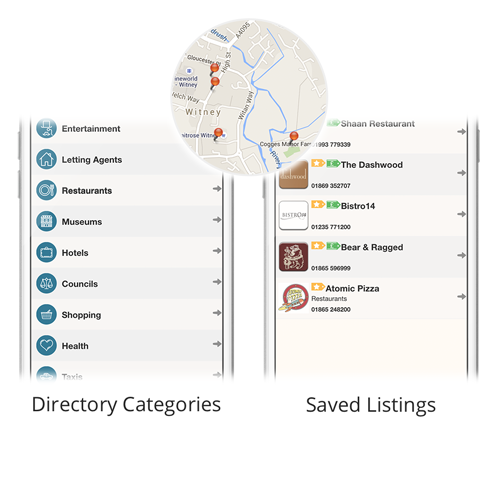 Then, users can search your directory of businesses, properties, vehicles and more using keywords, a category, or by distance. When they find what they’re looking for, they can get directions or add it to their favourites. And if something is missing, they can submit items to your directory. To keep students engaged in between classes, make your blog content, social media activity, videos and more accessible inside your app. Push notifications and special offers to customers when they are near your shop or a competitor’s. Show an always up-to-date menu and tempt customers with pictures of your newest drinks and desserts. 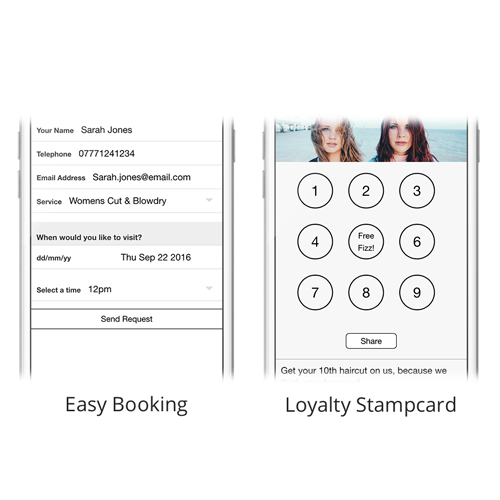 Build a loyalty program that fits your business to encourage repeat customers. 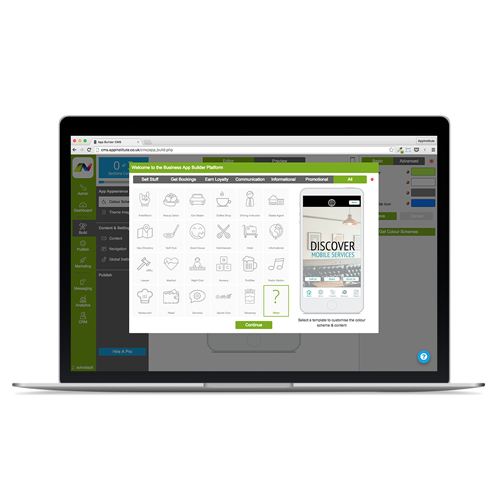 Select from 20+ business types, make modifications, or create your app from scratch - no coding required. I do want to say this is the best customer service I’ve ever had, thank you! The support I’ve received from the team has been impeccable, and one of the main reasons I chose AppInstitute over other app makers – they really make you feel important to them. Mix and match features to make your app your own. Or, edit your app until it’s exactly what you need — no coding required. Guarantee brand consistency by pulling business information, logos, photos, and colour schemes from your Facebook page and website. No digging for hex codes and entering manually. 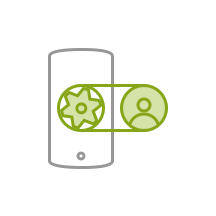 Keep users in the loop and improve attendance by adding events to your in-app calendar. Users can RSVP for events, add them to their own calendars, and create reminders. Boost engagement with your business by adding new content on a regular basis. 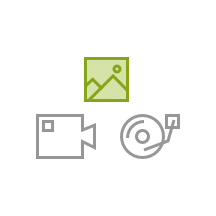 Upload videos, stream audio, create image galleries, and connect your blog. Add, remove, and edit your app’s features, text, media, and more with a simple drag and drop app builder. 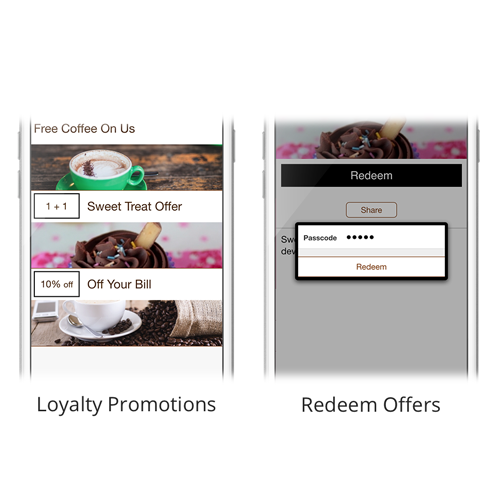 Reward customer loyalty with special offers and rewards using in-app stamp cards, coupons, check-ins, and QR codes. 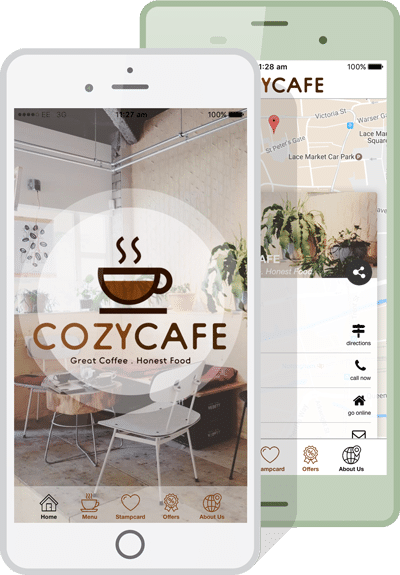 One click payments and the ability to add unlimited categorized listings makes it easy to create a food ordering or m-commerce app. 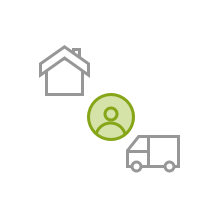 Trigger notifications and messages based on a customer’s location, time, and segment. 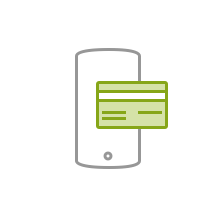 Notifications can contain discounts, updates, special offers and more. Increase engagement with your brand via social media integrations. 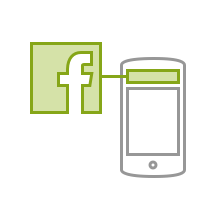 Your users can access your Facebook and Twitter feeds without leaving your app. Connect people with places, things, and businesses. 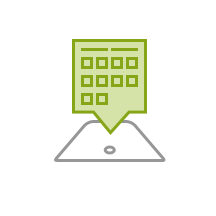 GEO listings make it easy for your users to add and search GEO tagged properties, vehicles, businesses, and more. We’ll do it for you at a fraction of what a developer will cost you. One of our expert app builders will connect with you to discuss your app’s requirements in detail. We’ll take your requirements and build the app you need while you continue to focus on your business. When you are 100% satisfied with your app, our app makers will get your app live and ready for your customers.